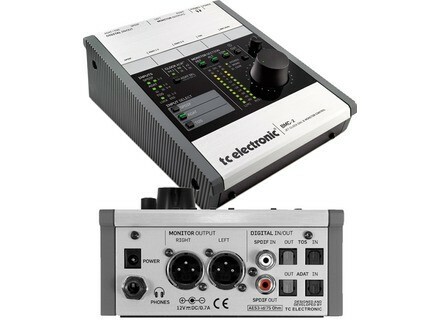 BMC-2, Monitor Controller from TC Electronic. 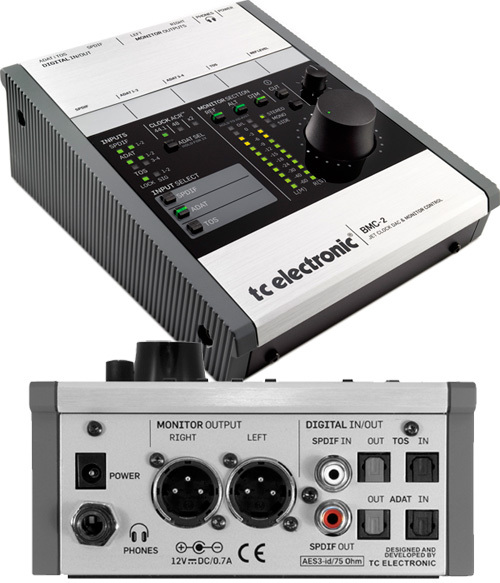 TC Electronic will be launching BMC-2 at the 2009 Frankfurt Musikmesse, a dedicated Digital-to-Analog Converter and high quality Monitor Control that's suited for use with digital and analog speakers. Inputs: Connect the inputs you wish to use. The S/PDIF input also handles AES3 and AES3-id format. Simply press one of the three INPUT SELECT keys to select the input you wish to listen to. Outputs: Analog speakers connect to the XLRs, digital speakers to the S/PDIF output. The S/PDIF output is really an AES 3-id output, so can drive AES inputs, even over long cable runs. Level Control: The big level knob controls the level to the speakers unless REF is active. The knob produces transparent gain settings with 0.0dB at the 3 o'clock position. iCheck: Data reduced audio is not the same as 'CD quality'. BMC-2 provides a shortcut for revealing artifacts of data reduction. At bit-rates lower than 256kbps for stereo, the spatial imaging is often compromised, which may be easily exposed by listening to the components of the image in isolation. For more info, check out www.tcelectronic.com. Blue Sky SAT 8 & SUB 212 Blue Sky has introduced two new listening components to its line of monitoring solutions: the SUB 212 400-Watt Push-Pull Active Subwoofer and the SAT 8 300-Watt, Compact Mid-Field Monitor.